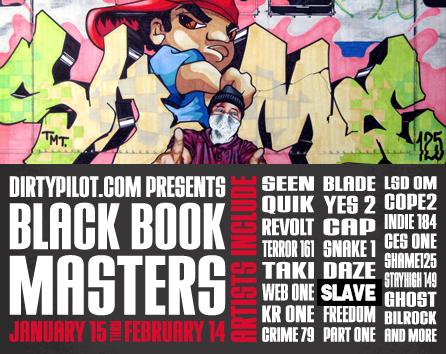 DirtyPilot Presents ” BLACK BOOK MASTERS “. 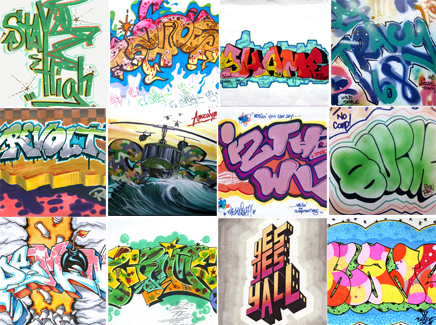 A collection of drawings by graffiti Legends. 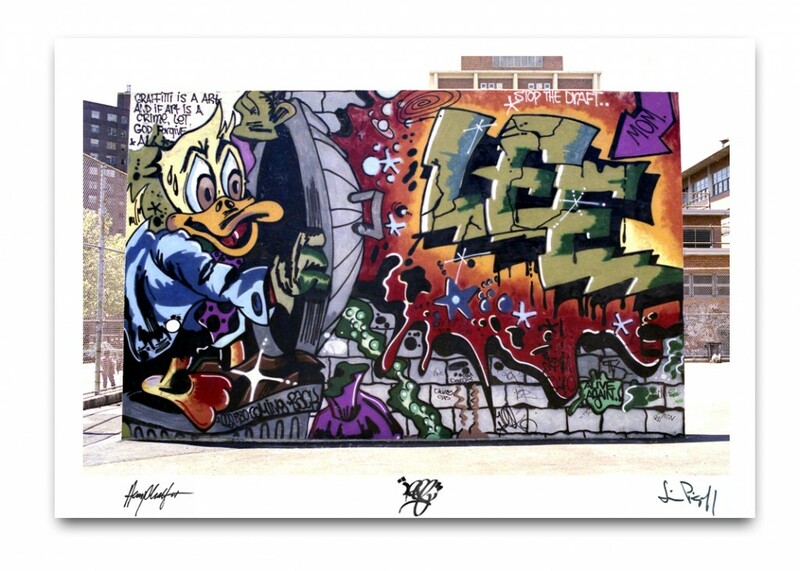 “Doing pieces and outlines in your own, and other writers black book, is a graff tradition that has held up and has been there from the beginning. With the NYC subway graffiti era gone (but not forgotten) blackbooks, now more than ever are a vital part of preserving the culture. Drawing in black books are still a common denominator, whether you wrote on trains, walls or whatever, black book trading is still something special and personal – the exchange of art between its practitioners. The result is something precious and ever lasting that can be held and appreciated without the inevitability of being whitewashed or blasted from existence. There aren’t many things that we continue to do as adults that we began doing as children. Black books are today’s link to yesterday’s dreams”. Dirtypilot.com is thrilled to offer collectors a window into the private world of black books and chance to own a piece of history by one of your favorite writers. Henry Chalfant, James Prigoff “LEE Handball Court” Photo. 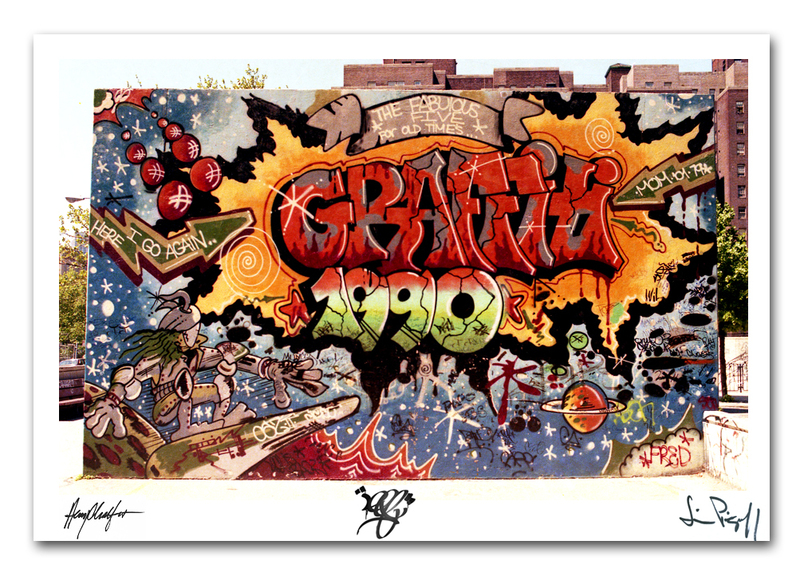 Originally published in The All Time Graffiti Classic Spraycan Art. (Published by Thames and Hudson-London-1987). Each Cibachrome print is an edition of 100 and measures 20×16. Printed on high quality photographic paper. Each photo comes hand signed in marker by LEE Quinones, Henry Chalfant and James Prigoff. Published by DirtyPilot Editions. Of the few mavericks from the Subway art era that make the cut based on their iconic breakthroughs, not one thing has weathered the test of time and stood guard more while announcing the movements presence than the Handball court paintings of (LEE) Quinones. 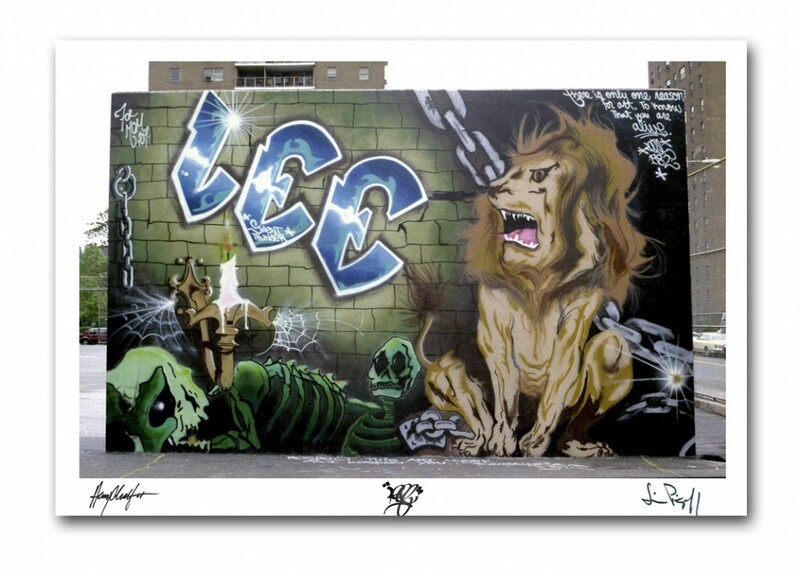 In short, Lee was well known for his rapid end to end Subway whole car paintings before these walls, which meant that he had traversed high barriers by 1978 to achieve what he did with these standing street masterpieces. Like towering tablets of a bygone mythological era, NYC’s Lower East Side Handball courts attracted Lee’s eyes to serve as beacons in literally ushering in an art movement and its underground brethren to the open world above. That open world being the alternative downtown art scene. Vibrant and vanguardist as the walls were at the time, arguably they were the templates for todays offshoot street art movement since they inspired the late Keith Haring’s “Crack is Wack” handball wall paintings among others shortly after. Marinate on this for a minute, under the cover of darkness, armed with bags of fat capped Spray paint cans, a track workers ladder, and a fierce determination within a mere 10 hour window, Lee pulled off each wall in grand splendor to the delight of his fellow Lower East Siders, contemporaries, the authorities and the world there after. The walls are now gone but their impact surely etched in New York art history. That being said, here for the first time available, are three LEE walls created during that pivotal period of 1978-1982 as a fine Limited edition C print from the archives of Jim Prigoff and Henry Chalfant, two very important soldiers in their documental feat. Add to this the fact that each and every print will be signed and numbered by Jim Prigoff, Henry Chalfant and Lee himself, thereby sealing their authenticity. A great Christmas and Three Kings Day gift.